Uncertainty Quantification is the field of mathematics that focuses on the propagation and influence of uncertainties on models. Mostly complex numerical models are considered with uncertain parameters or uncertain model properties. Several methods exist to model the uncertain parameters of numerical models. Stochastic Collocation is a method that samples the random variables of the input parameters using a deterministic procedure and then interpolates or integrates the unknown quantity of interest using the samples. Because moments of the distribution of the unknown quantity are essentially integrals of the quantity, the main focus will be on calculating integrals. Calculating an integral using samples can be done efficiently using a quadrature or cubature rule. Both sample the space of integration in a deterministic way and several algorithms to determine the samples exist, each with its own advantages and disadvantages. In the one-dimensional case a method is proposed that has all relevant advantages (positive weights, nested points and dependency on the input distribution). The principle of the introduced quadrature rule can also be applied to a multi-dimensional setting. However, if negative weights are allowed in the multi-dimensional case a cubature rule can be generated that has a very small number of points compared to the methods described in literature. The new method uses the fact that the tensor product of several quadrature rules has many points with the same weight that can be considered as one group. The cubature rule is applied to the Genz test functions to compare the accuracy with already known methods. If the cubature rule is applied to $C_\infty$-functions, the number of points required to reach a certain error is a factor less than the number conventional methods need. However, if the cubature rule is applied to $C_0$-functions or to discontinuous functions, results are not good. Because no stringent upper bound of the number of points of this cubature rule can be determined, it is not possible to create a general multi-level method and balance all the relevant errors. Therefore, a new method is proposed that balances the errors for each sample point. It consists of determining the cost function of a cubature rule (which is essentially the sum of all the cost of all the points) and then minimizing this cost function given an maximum error bound. The solution can be found using either the Lagrange multipliers method or Karush-Kuhn-Tucker conditions. The new proposed method is applied to two different test cases to test the quality of the method. The first test case is the lid-driven cavity flow problem and is used to compare the new UQ method to conventional UQ methods. The second case is simulating the flow around an airplane with uncertain geometry and uncertain flow conditions. van den Bos, L.M.M. (2015, December). 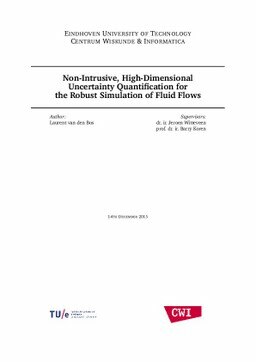 Non-Intrusive, High-Dimensional Uncertainty Quantification for the Robust Simulation of Fluid Flows. TU/e Master Report.